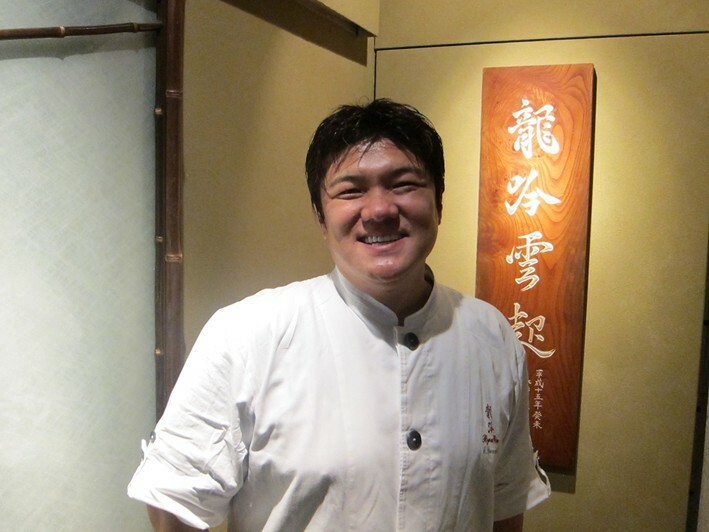 Seiji Yamamoto is the chef and owner of 3 star Michelin restaurant Ryugin in Tokyo. 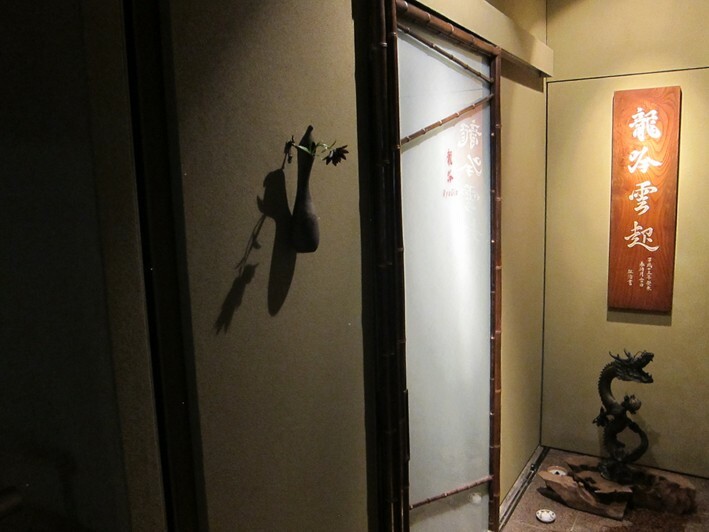 Ryugin moved from its Roppongi home in mid 2018, which it had occupied since December 2003. 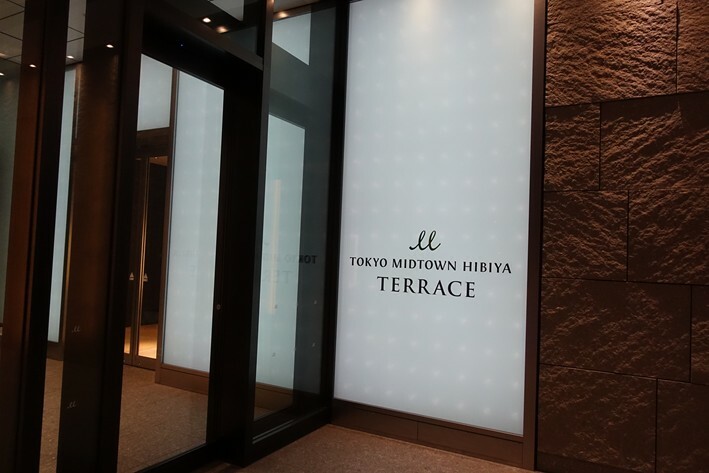 It is now on the seventh floor of the Midtown Hibaya development, a smart shopping and residential development in Chiyoda. Just take a lift to the restaurant from the ground floor of the mall, in an elevator where the seventh floor was labelled “restaurant” rather than explicitly “Ryugin”. The new dining area seats forty guests and is very smart indeed, many tables having a fine view out over the city from this top floor location. 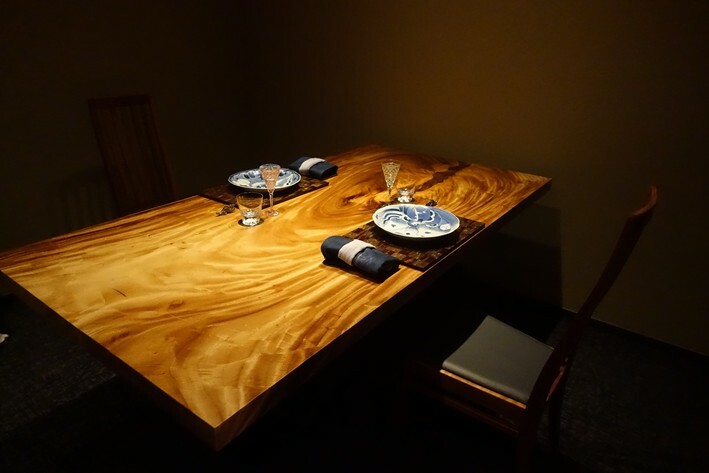 Tables are well spaced and large, serviced by an army of well drilled waiters. 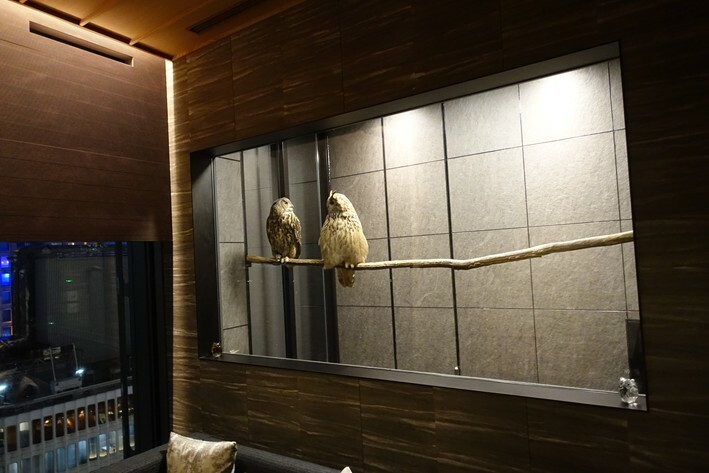 There was a little waiting area with, rather disconcertingly, a pair of live owls on a perch in a glass case. These were handsome creatures, but it was a bit sad to see them cooped up like this. 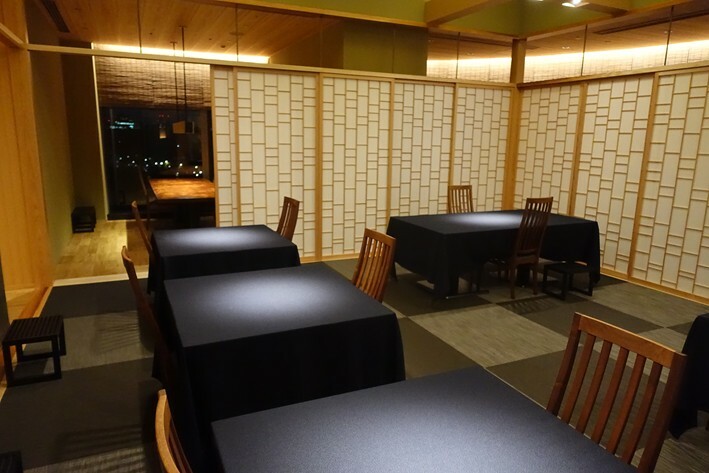 At the new location there are lots of little extra details in the service experience; for example you are offered a choice of chopsticks in boxes, which you can take with you as a souvenir if you wish. When the bill arrives you are presented with a very grand looking pen to sign the credit card, in keeping with the scale of the bill. 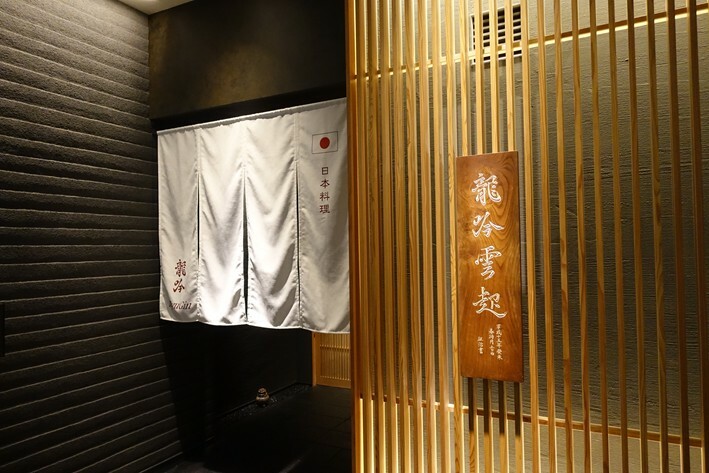 There was a no-choice tasting menu at ¥35,600 (£241) and the new Ryugin has a substantial wine list and takes no prisoners on the price front, starting at ¥20,000 (£135) and climbing rapidly in price, with very few choices below ¥30,000 (£204). Sample references were Billecart Salmon NV champagne at ¥27,000 for a bottle that you can find in the high street for ¥6,986, Henschke Mount Edleston Shiraz 2010 at ¥45,000 compared to its retail price of ¥17,018 and Miani Buro Colli Merlot 2013 at ¥60,000 for a wine that will set you back ¥29,735 in the high street. For those with the means there was Jacques Selosses Substance at ¥105,000 compared to its retail price of ¥44,022, and Bollinger Vieilles Vignes Francaise 2006 at ¥180,000 for a wine whose current market value is ¥98,160. The sensible option might be beer, at ¥900 a bottle for Kirin (£6.12). The menu began with an appetiser of turtle soup with a poached egg and notionally a rice cake, though this was hard to detect. I have had turtle soup before in China, and it used to be a delicacy in Britain. The eighteenth century London Tavern in Bishopsgate used to keep live turtles in their huge cellars, alongside their huge wine collection, for use in their signature turtle soup. 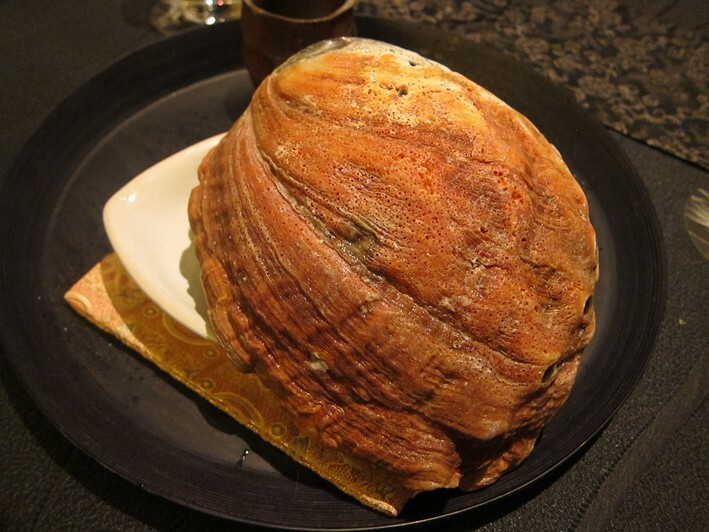 I don’t find turtle to be especially appealing as a meat, having quite a rich flavour that is hard to characterise, but also tending towards chewiness. The egg used in the soup here had an impressively deep orange yolk and good flavour, so this was certainly interesting (16/20). This was followed by a cold green soy bean soup had had quite a deep bean flavour, though I wonder whether this might have tasted better hot (15/20). 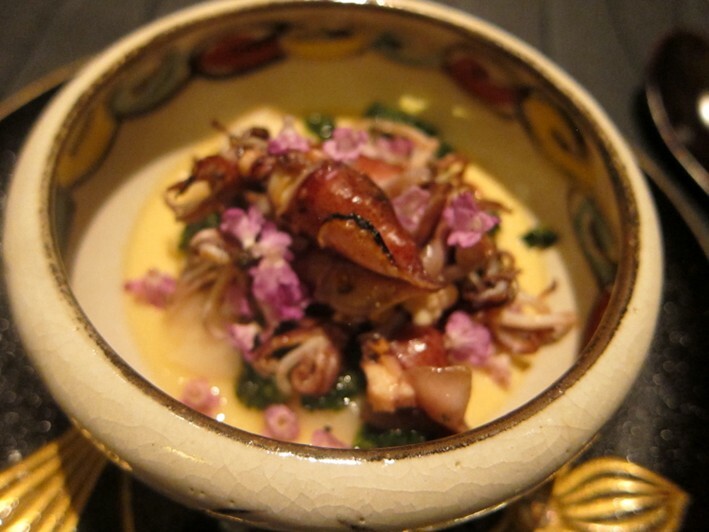 Next was abalone and matsutake mushrooms with a sauce made of the abalone liver. 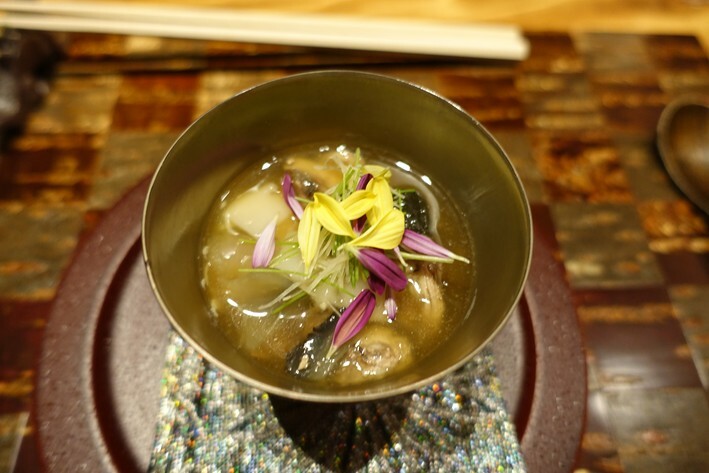 The mushrooms were very good and the abalone was tender, the liver flavour relatively subdued but an interesting contrast to the earthiness of the mushrooms (16/20). 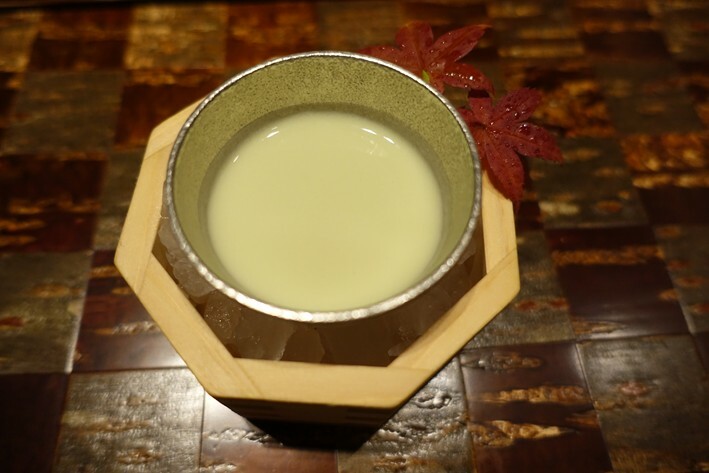 This was followed by a teapot containing a broth with amadei or tilefish, along with a shrimp and hamo or pike eel. 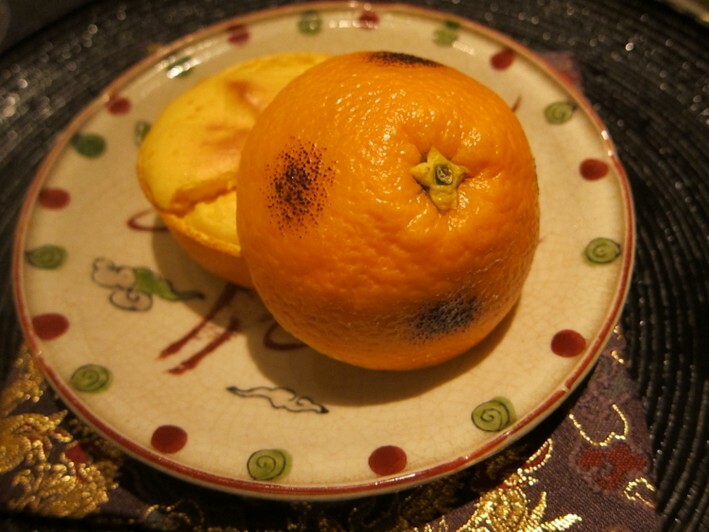 On the side was a little cup into which a Japanese citrus fruit called sudachi (like a small lime) was squeezed, and this certainly went well with the soup, providing some useful acidity. 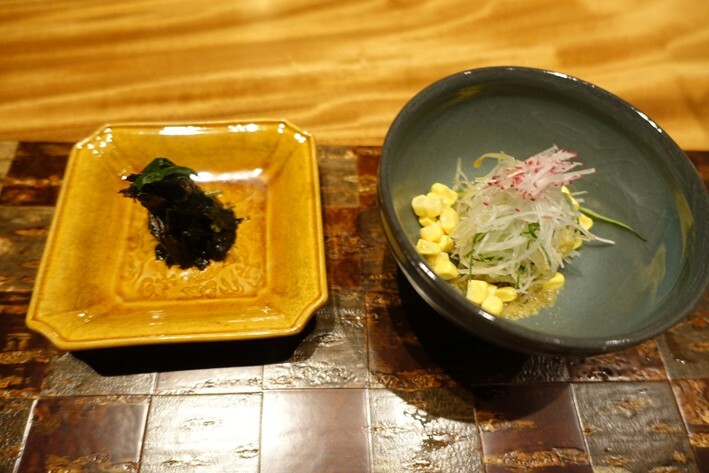 There were also condiments of pickled daikon radish, ginger, shiso and corn along with seaweed pickle. 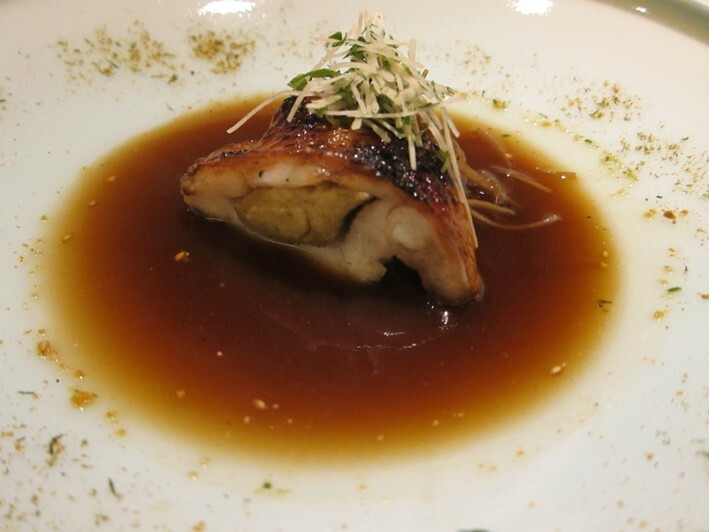 This was pleasant, the amadei retaining its texture quite well, but the pike eel was unsurprisingly rather soggy. 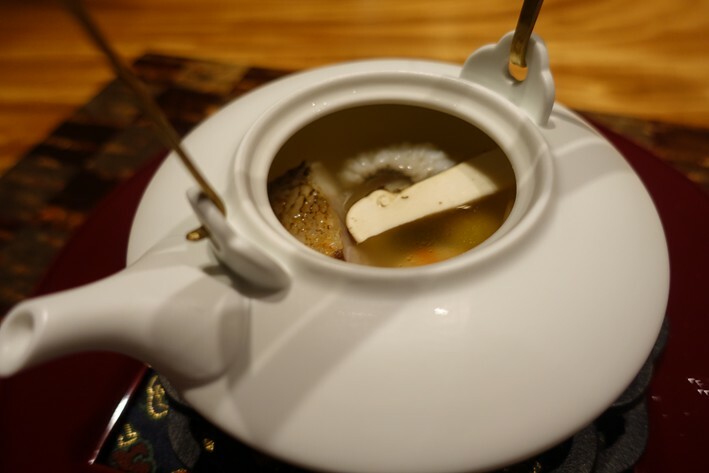 The flavours were fine but I am just unconvinced that fish tastes better after resting in a soup, traditional though this is in kaiseki cuisine (16/20). 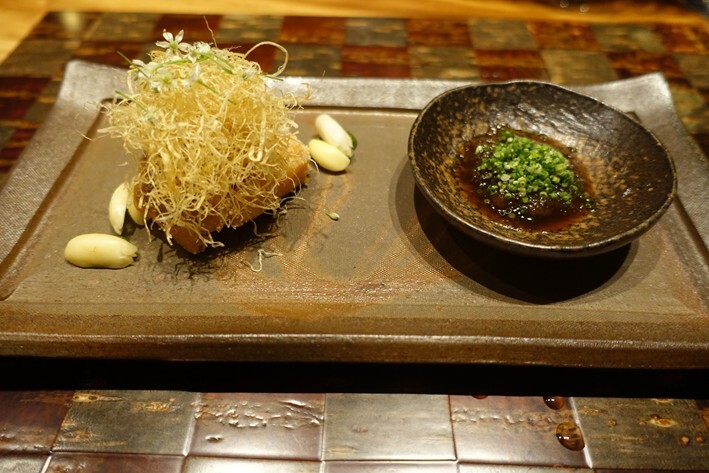 Sea urchin from Hokkaido was of excellent quality, served on top of aubergine (17/20). 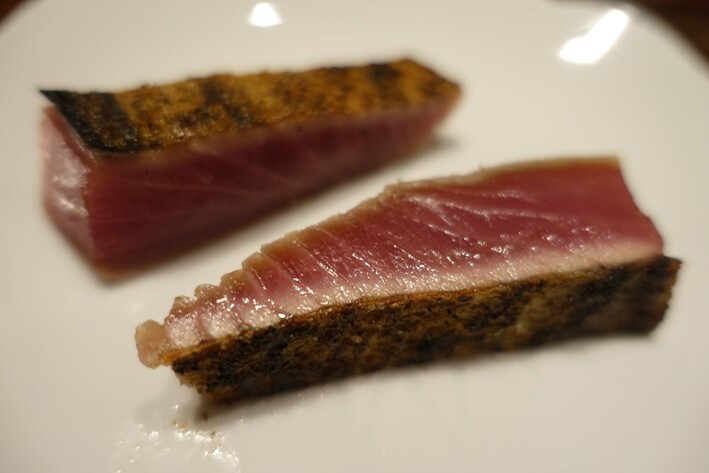 This was followed by the dish of the meal, charcoal grilled bonito, which was served simply with a little salt and had absolutely superb flavour (19/20). 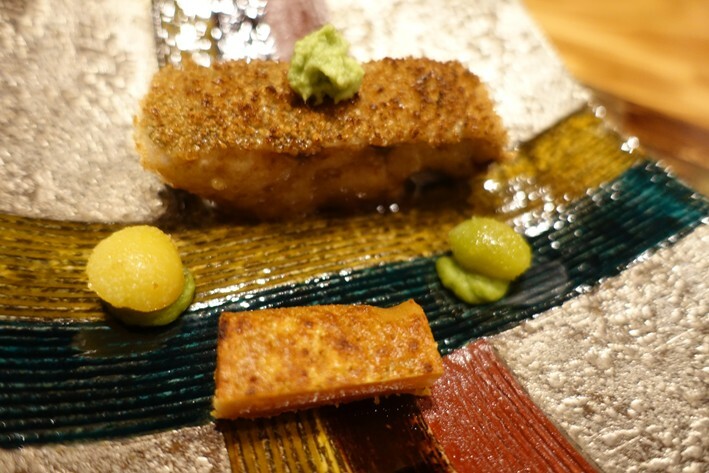 Sea perch was also charcoal grilled and served with karusami, sort of home made bottarga, a salted and sun-dried mullet roe. The perch was excellent, carefully cooked and having taken on a pleasing smoky flavour note from the charcoal grill (18/20). 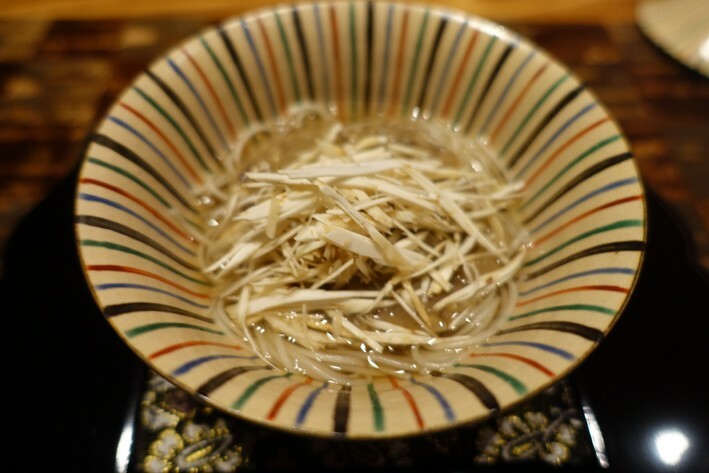 This was followed by somen, very thin noodles that had been aged for three years, served with shiitake mushrooms and dried scallop and prawn, with a garnish of matsutake mushroom. This was pleasant, the noodles having good texture and the mushrooms plenty of flavour (16/20). My last savoury course before the traditional rice conclusion to the meal was venison. 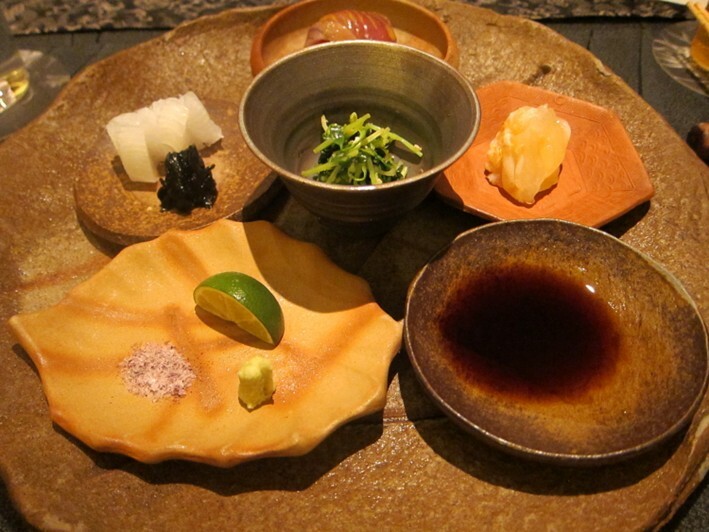 This deer was from Furano in Hokkaido, and was served as quite large pieces. 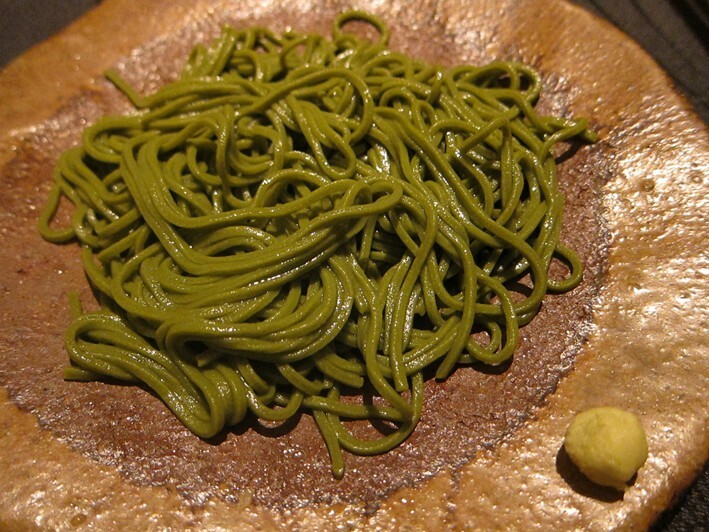 It was slow cooked and served with wasabi and soy along with some oddly bland cooked peanuts. Although the venison had good flavour it had a slightly odd texture. It was not chewy by any means, but required more gnawing that I would have expected from top end venison (16/20). 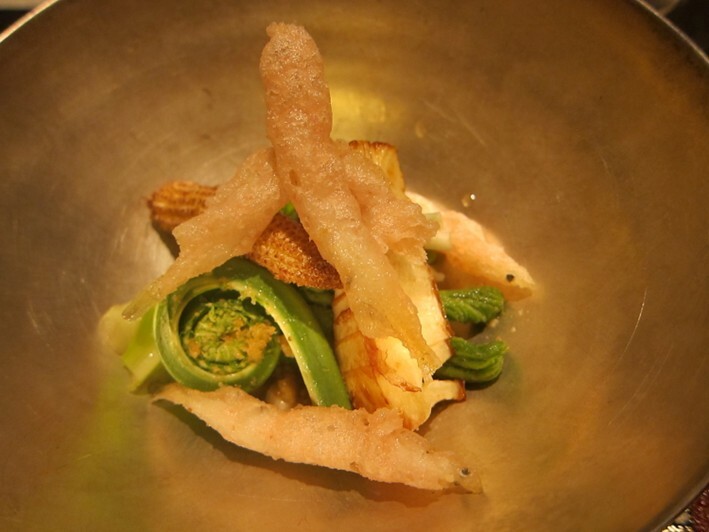 A pescatarian alternative was deep fried snapper with ponzu sauce, which I actually preferred (17/20). 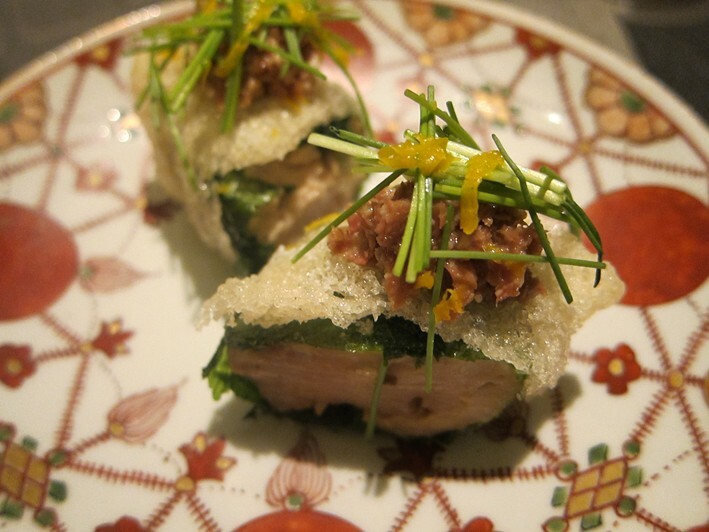 A kaiseki meal traditionally concludes its savoury section with rice and pickles. 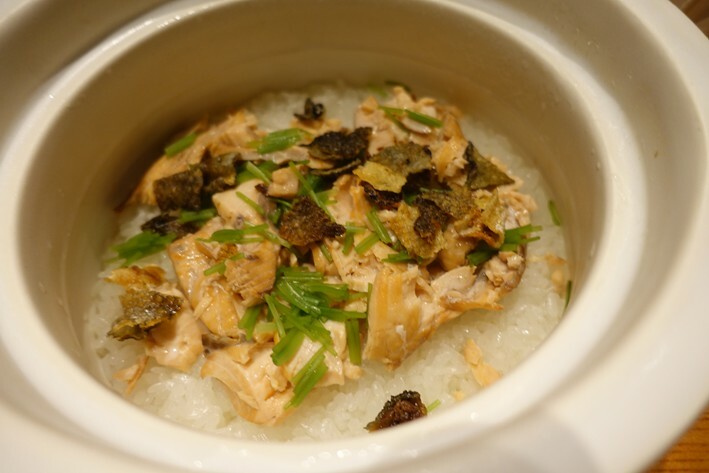 Here the rice was enlivened by some Pacific salmon. 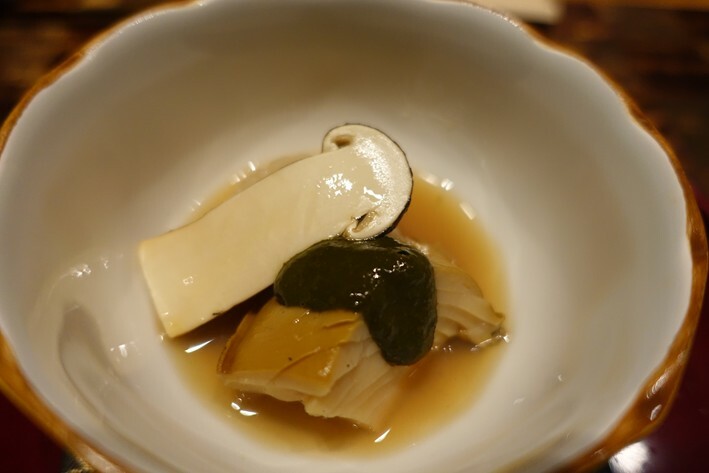 There was also a miso with prettily shaped tofu in the shape of a chrysanthemum flower, and pickles of radish, coriander and wild rice. Two desserts were offered. 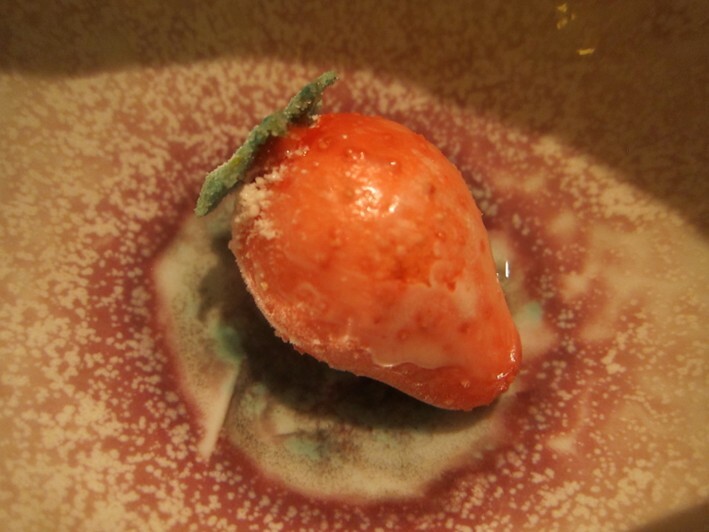 The first was a black fig with sudachi ice cream topped with refined sugar. 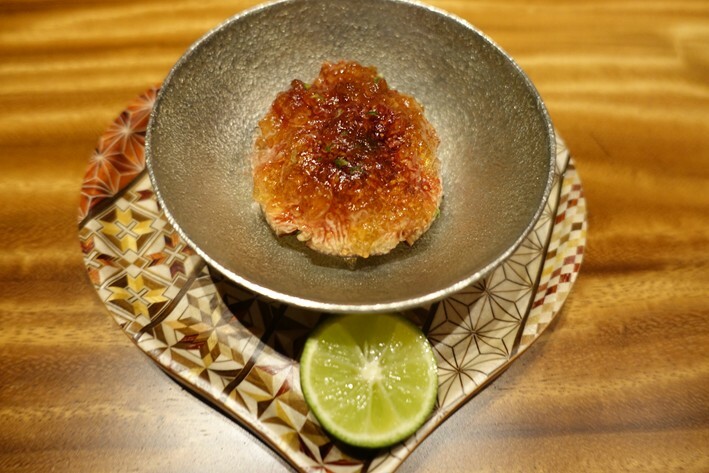 The fig had good flavour and the acidity of the sudachi balanced the sweetness of the sugar (17/20). 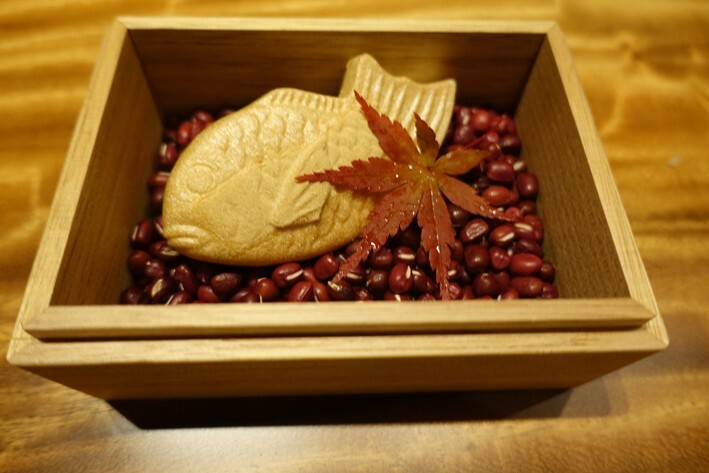 The final dessert was what looked like a biscuit filled with warm sweet red bean paste, displayed in a pretty box. This was shaped like a fish, the outside actually being made with waffle batter and having very good texture, the red bean paste surprisingly good, as it is something that I usually avoid. 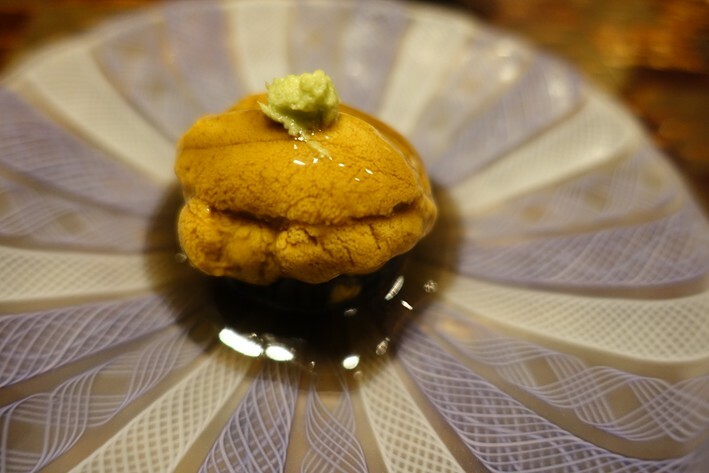 This is the Ryugin take on a classic Japanese dessert called taiyaki, named after the Japanese red bream or “Tai”, since Yuki means “baked”. 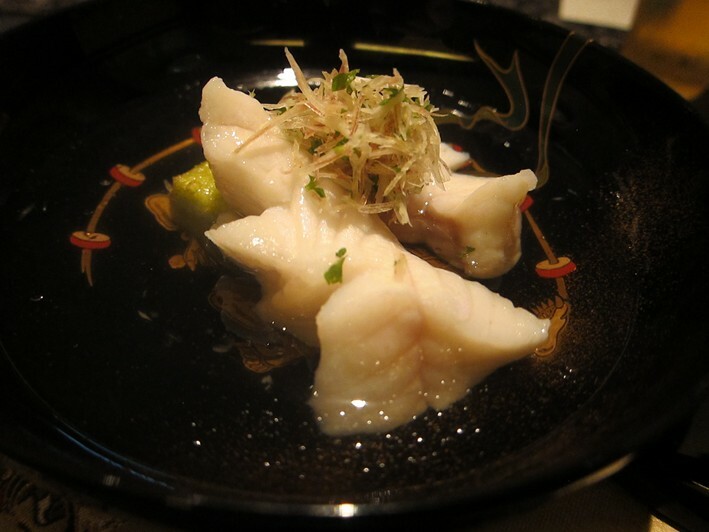 It is thought that the dish was created by Seijirō Kanbei at a shop called Naniwa Souhonten in Azabajuban back in 1909, the idea behind it being that red bream is considered auspicious. 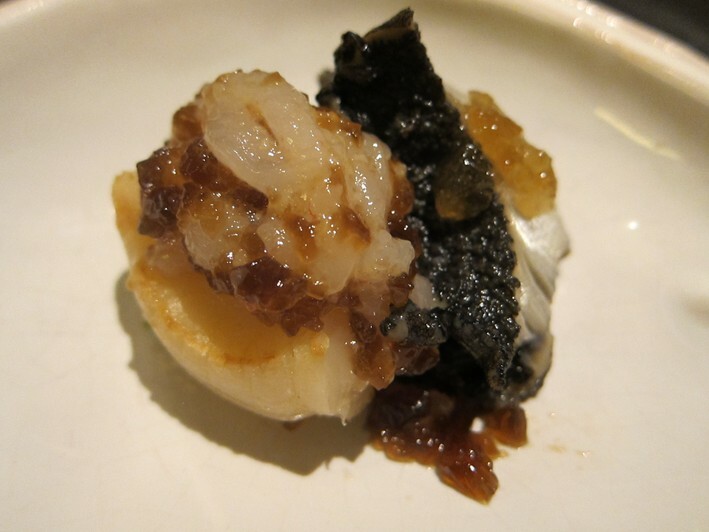 This version of the dish changed my view on the possibility of red bean paste actually being enjoyable, rather than something to endure, just as the abalone at my very first meal at Ryugin a decade ago was a revelation to me (18/20). 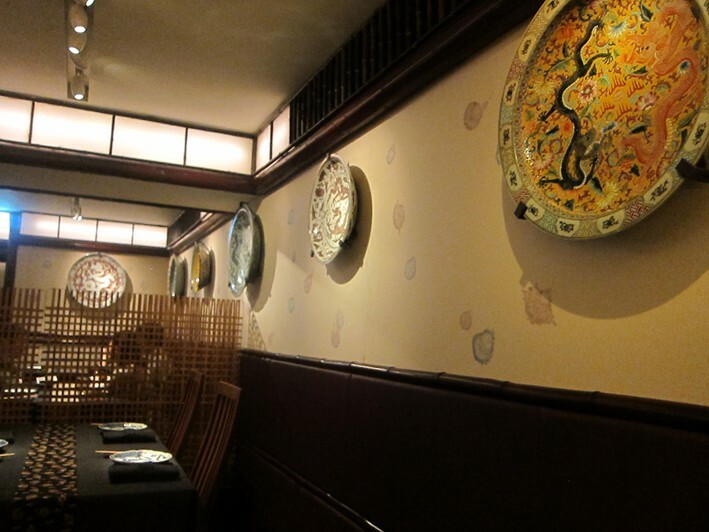 Service was silky smooth, the waiters speaking very good English and being very attentive all evening. 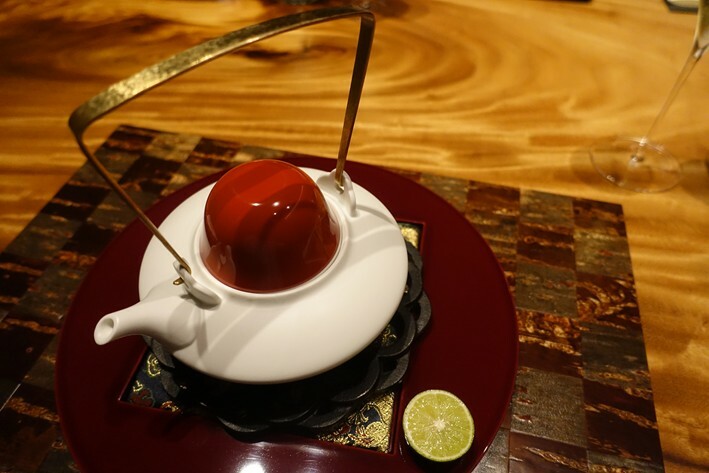 The bill came to ¥11,540 for two (£782) with the tasting menu, a bottle of champagne at ¥27,000 (£183) and water at ¥330 (£2), with service at 10%, working out at £391 each. By any standards this was an expensive evening. We shared a bottle of wine that was one of the cheapest on the entire list, so your bill could easily be higher, and even if you drank beer then you would still be spending £290 or so. 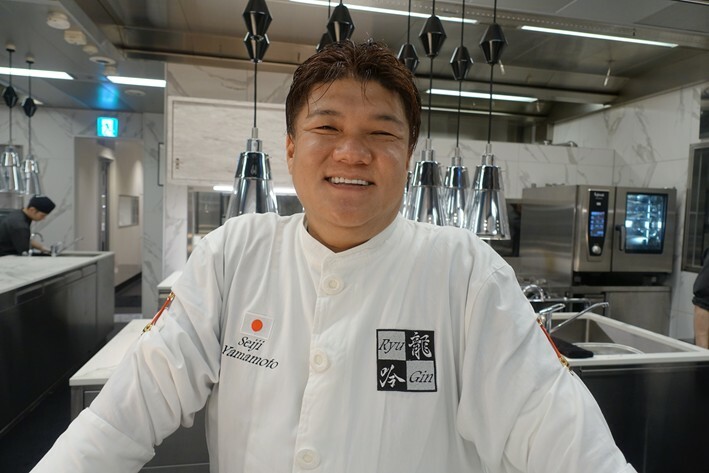 I have eaten two previous meals at Ryugin in the old premises and loved them, and also really enjoyed my meals at Ryugin Hong Kong and recently at Ryugin Taipei. However the meal tonight seemed a lot less impressive than these other meals, which is troubling given the extremely high price point. This made me rather sad, especially when I got the bill. 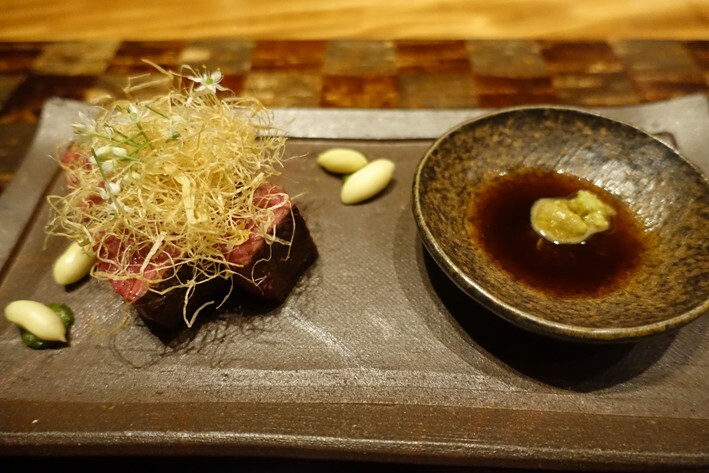 Objectively it is still good food, but for me this meal was a substantial dip in standard from my previous visits, even ignoring the value for money factor.